So, I am setting up a world for a DND campaign in which, through a magical accident in the past, the face of the globe is covered in ocean, all except for a few tiny islands where the highest mountain peaks were (I am hand waving the obvious problems with altitude and climate as the nature of the accident was essentially wishing for "more water on the planet" and it isn't really relevant to the story). So society has finally recovered from the initial shock and settled into a state of equilibrium. One of the factions that has risen up in the interim is a builder faction who take dirt from the sea floor and carry it to add on the islands or shallow areas to make new landmasses and the party is tasked with protecting one of their expeditions. I was just wondering how to mesh the dredging aspect in believable as it would have to be mostly mechanical in nature, as spell-casters can't function underwater naturally. I have tried looking into how dredging was done it ancient times but there is not much information. Originally I had planned on having each expedition have divers who have strength enhancing and water breathing spells swim down and carry large amounts of dirt in bins but I was wondering if there were more elegant solutions. So, what are the most logical ways for PC's and NPC's in a DND setting to get old things off the ocean floor? A lot of this is going to depend on how deep your NPCs will be dredging. Dredging has been used as far back as 4000BC to build harbors and affect the characteristics of rivers. Most used boats with a crank and some buckets. 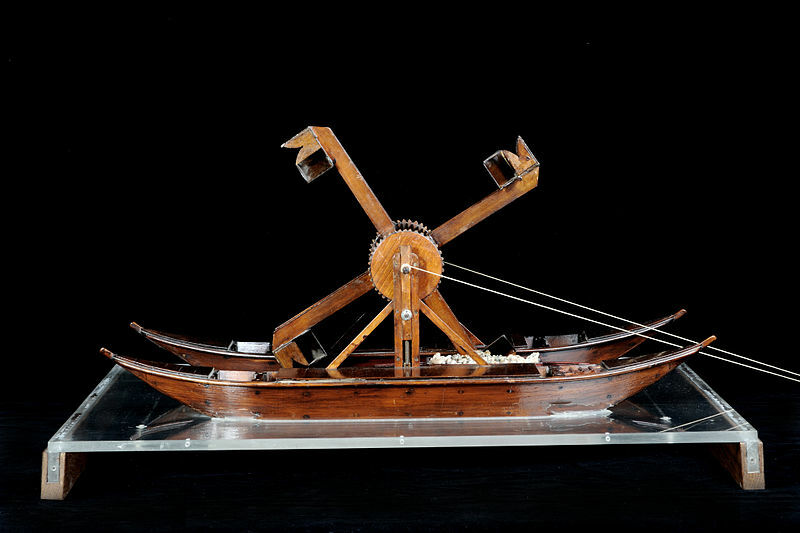 DaVinci even invented a river dredger that would use the current of the river itself. The trick is that all of these are done in fairly shallow water. Deep water dredging is incredibly difficult, even today, and the only way I could see it being done at any kind of reasonable scale is with automatons that just walk along the bottom of the ocean. If your world is shallow enough you can use a similar technique as well as a handful of spells such as bones of the earth which can make great pillars of earth spring from the ground Control Water, which can do a "part the seas" effect, or Move Earth which can reshape the earth itself and slowly raise its terrain. Again though, a lot of this is going to depend on how deep these oceans are. There were two types of common dredging: drag dredging which was rare and more focused on shellfish and sponges and shovel dredging which only works in shallow water. drag dredging was literally dragging a bucket or net over the sea bottom. Shovel dredging was literally using a really long handled shovel and s series of winches to bring up sediment one, admittedly large, shovelload at a time, these are used primarily to dig channels and maintain rivers. either way your limits are not strength of the lifter but strength of ropes and shear man hours. But in DnD you have some help. A ritual spell called water breathing. so unlike real methods people can actually go down with dredge buckets and fill them manually instead of relying on drag. Fitting ships with treadwheel crane was done in ancient so lifting the bins/buckets is easy. Of course adding to a mountain is going to mean moving gargantuan amounts of earth even to get a tiny sliver of land, since it will of course both fall down slope and be eroded away by wave action. You are better off inventing a spell that creates earth, given the strong need it would not be unreasonable. You can still use dredging for collecting shellfish, sponges, and treasure. Not the answer you're looking for? Browse other questions tagged environment construction or ask your own question. Fantasy/Medieval setting - materials to build when wood and stone aren't an option? Could a society use kilocalories for setting the base price of goods/services? Could it be feasible that a medieval fantasy city in the desert be carved into rock rather than made with lumber?